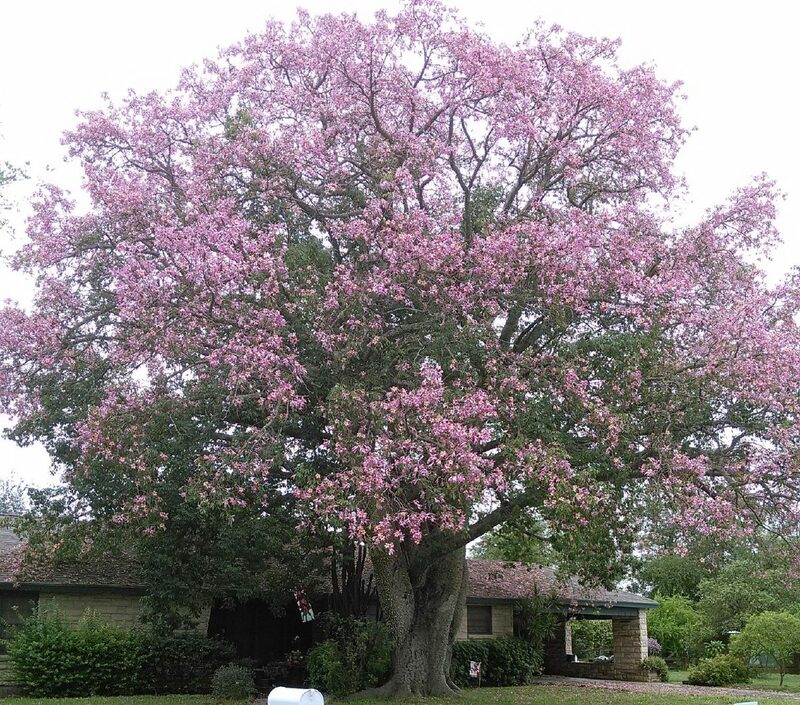 Silk floss trees (Ceiba speciosa) are blooming in landscapes across the Rio Grande Valley. These spectacular gems are native to tropical South America. In the United States, these trees are grown in Southern California, South Texas and Florida. They easily grow 50 to 60 feet in both height and across the tree canopy. Silk floss is a dramatic street tree. They often line boulevards in South America or they are used as specimen trees in dramatic landscapes such as zoos and botanical gardens. In South Texas, they appear in older subdivisions, where lots are large. They have an aggressive root system and should be kept at least 30 feet from structures. The lily-shaped flowers have five petals with variable flowers that are pale pink, rose, or purple along the outer edge of the petal with ivory to peach colored centers. The tree drops its leaves just before flowering in September or October, appearing to communicate that it wants nothing to interfere with the observer seeing its “showstopping” flower display, which remains about six weeks on the tree. Hummingbirds and insect pollinators enjoy the nectar of these flowers, which give way to a capsule of seeds surrounded by silky-white floss. This floss was once used as stuffing, especially for life-jackets and cushions on boats. Once established, the trees are drought tolerant and can handle a moderate cold spell. The trunk of the Silk floss is covered with thorns, or prickles, that are likely meant to deter animals such as monkeys from climbing it. When young, the trunk is green and gradually becomes brown as it ages. Obviously, this is not a tree for small spaces. It requires plenty of room and well-drained soils as it will not tolerate sitting in flooded soils. It is fast growing when young. The silk floss is not prone to diseases and is fairly easy to maintain. And, it is best appreciated when you can see it from a distance. It could be used with two-story homes, in place of palm trees, or the tree could also enhance large properties with grand entrances. The silk floss is under-utilized in the Rio Grande Valley and one we should consider for our parks and avenues where the dramatic “showstopping” blooms can be seen. Barbara Storz is a local horticulturist. You can listen to her gardening show at 7 a.m. Saturdays on 710 KURV Radio. Email her at bstorz@rcommunications.com.